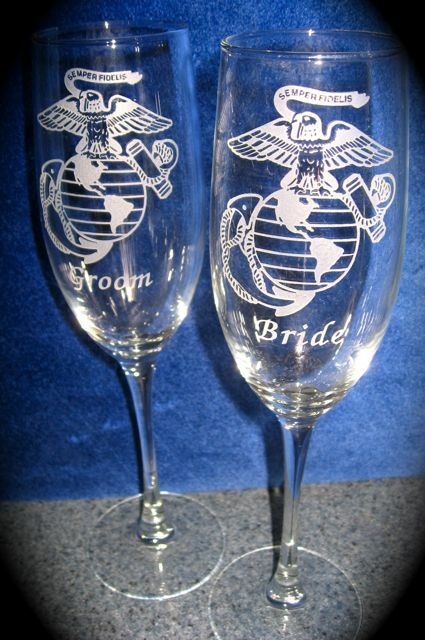 We can engraved most of the Military insignia on our Toasting Flutes. 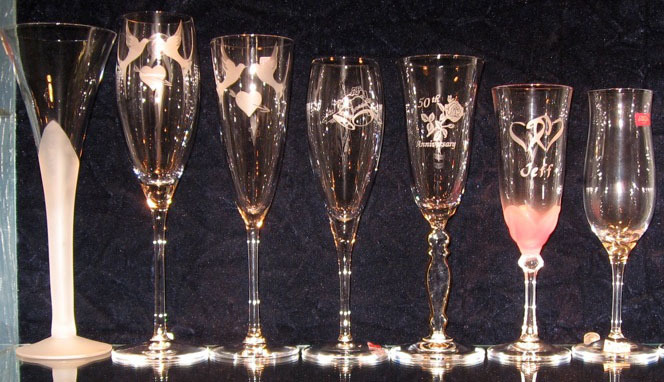 Here we are showing just a few of styles of the military designs we have engraved on our champagne glasses. 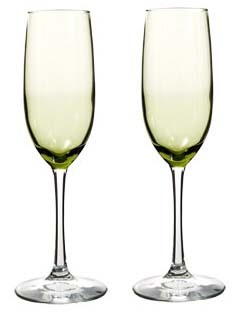 We have a number of different champagne flutes that can be engraved with initials or with just a name. Some are glass and others are crystal. Yes we can engrave our glasses with logos, and custom designs. All of our champagne glasses can be custom engraved. If you scroll down further there are two photos that show our crystal flute champagne glasses and our glass ones. The second photo below shows the Selection Crystal champagne glass and the Connoisseur 8 oz Flute are glass champagne glass, along with the Signature 5 oz Flute side by side. So you can see the height difference. These are our Connoisseur 8 oz champagne glasses. They are $21.95 each engraved with an Army, Air Force, Marines, or Navy logo and a 6 letter name. Extra letters or numbers are just .50 per letter. 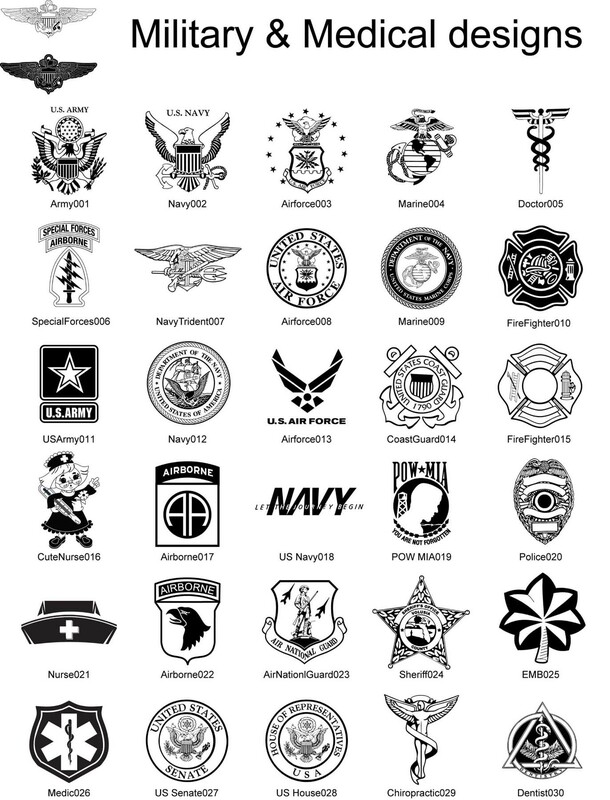 You may choose form our other military logos available like Army, Navy, Marines. Here's a close up of the US Army logo. If you scroll down you will see more of our champagne glasses, we can do this design on any of our champagne glasses. With us you are not stuck with only the glasses that you see the design on. Check them out. To order: email us at sowersglass@aol.com with your billing and shipping info as well as the engraving info, names, date, glasses design etc. 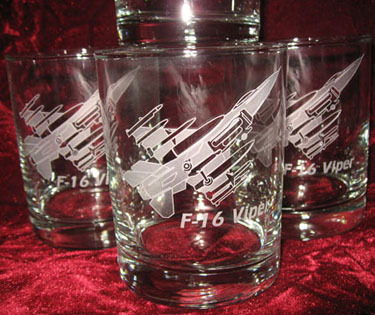 We can engrave Army, Air Force, Navy and Marine Corps Designs. We also offer thousands of logos that can be added, along with text, to our wedding champagne glasses. You can see a small selection of our designs here. 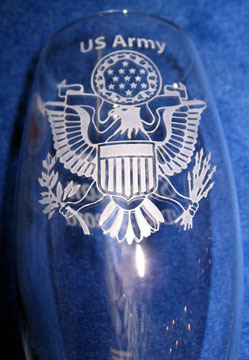 Our Connoisseur 8 oz Flute are glass champagne glasses and are $21.95 each with the military logos. 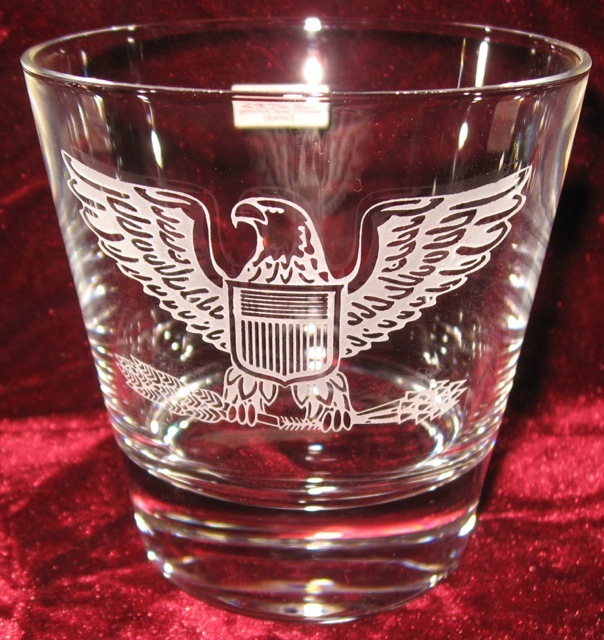 Shown here engraved with the Marine Corps logo. The price includes a 6 letter name. Here we have engraved Bride and Groom, however we can engrave their names and a wedding date. Extra letters or numbers are just .50 per letter. Our Signature 5 oz Clear Flute are glass champagne glasses and are $16.95 each with the military logos. 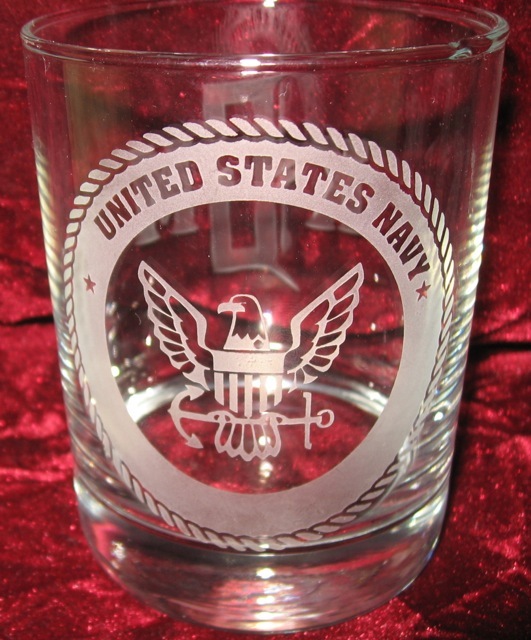 Shown here engraved with the Navy logo. We can engrave their names and a wedding date. Extra letters or numbers are just .50 per letter. These blue flutes are beautifully engraved with the Navy logos. We can also engraved any of our Military Designs on any of our champagne glasses. 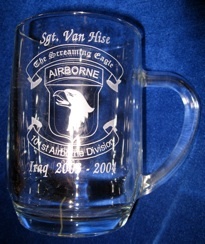 Personalized Engraved Special Forces Airborne Connoisseur 8 oz champagne Toasting Glasses. They are $21.95 each engraved with the design and a 6 letter name. Additional engraving is .50 per letter. 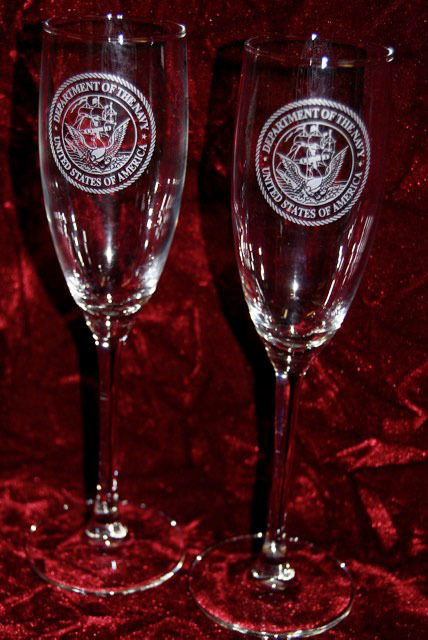 These crystal flutes are beautifully engraved with the Special Forces Airborne logos. 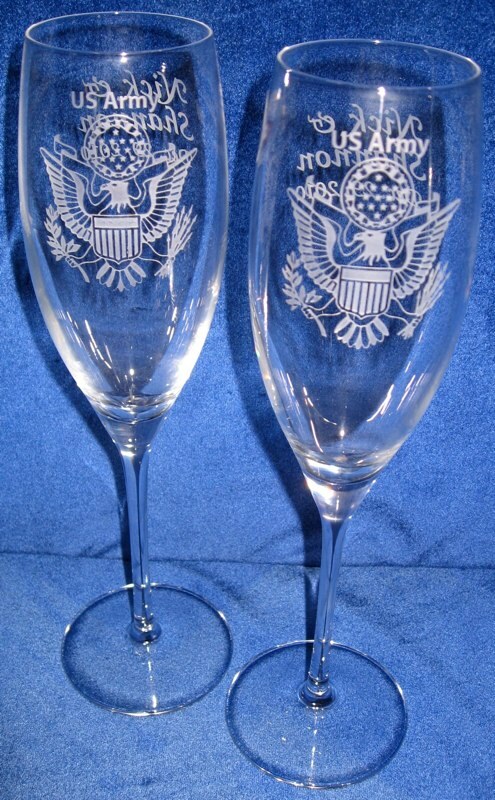 We can also engraved any of our Military Designs on any of our champagne glasses. These flutes are beautifully engraved with the US Army logs. We can also engraved any of our Military Designs on any of our champagne glasses. These green flutes or you may choose our crystal are beautiful engraved with the Army logos. 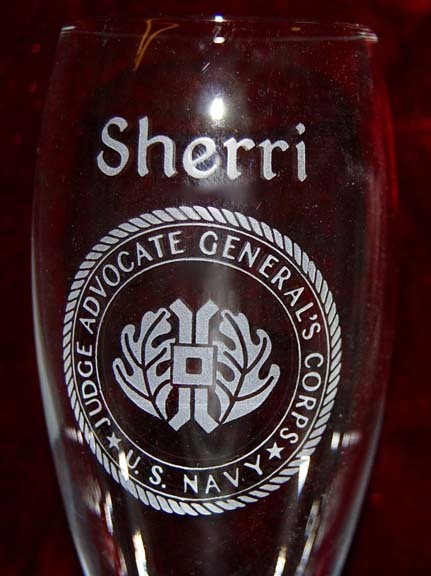 Personalized Engraved Judge Advocate Generals Corps US Navy Crystal champagne Toasting Glasses. They are $28.95 each engraved with the design and a 6 letter name. Additional engraving is .50 per letter. 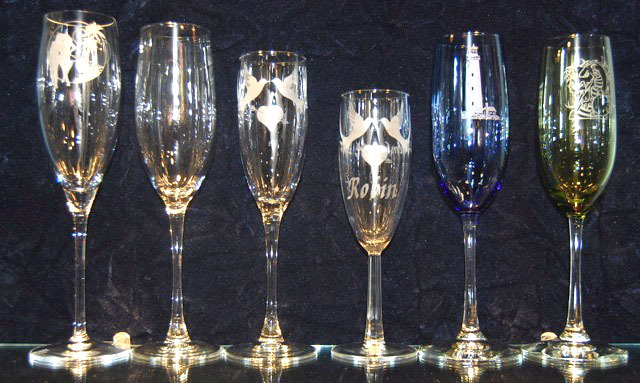 These crystal flutes are beautifully engraved with the Judge Advocate Generals Corps US Navy logos. We can also engraved any of our Military Designs on any of our champagne glasses. 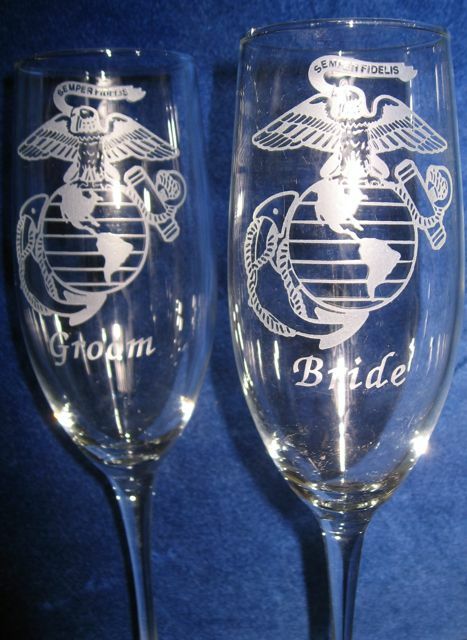 We also offer hundreds of military logos that can be added to our champagne flutes. 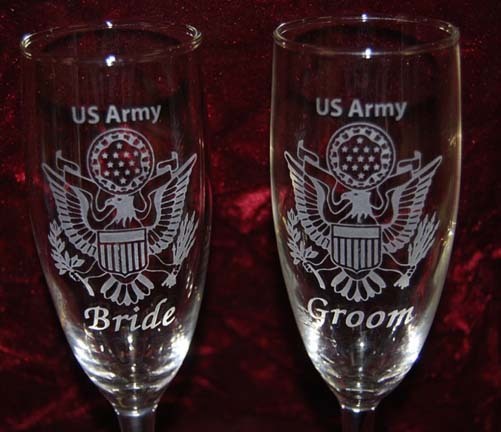 You can see of just a few of the Military designs that we can engrave on any of our wedding champagne glasses below. We can use other things to create the engraving. 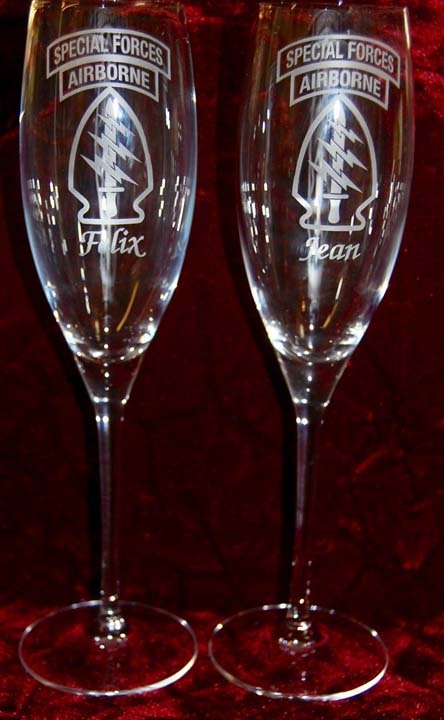 We do have other logos that we can engrave on your wedding champagne glasses. 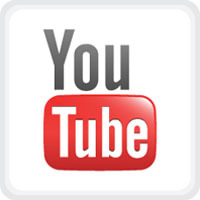 Call us 386-761-4527 or email: sowersglass@aol.com us your order! These are the names of our Engraved Crystal Wedding Champagne Glasses Left to right: Hollow Stem $39.95 with frosted stem or (32.95 with a one of our designs) Item #C1, Selection Flute $32.95 Item #C2 not available, Enchantment $26.95 #C3, Alpha $26.95 Item #C4, Victorian $28.95 Item #C5, Pink Crystal Flute $28.95 Item #C6, Beaumanoir $24.95 Item #C7 and Venise Saphir $26.95 Item #C8.